Rajendra Pachauri is described by the left-wing Guardian, in just one article, as a "climate expert," a "leading scientist" and "the world's leading climate scientist." Pachauri is the head bureaucrat at the body the world's politicians set up, via the UN, the Intergovernmental Panael on Climate Change. But I wondered, is he really the "world's leading climate scientist?" I wondered if he's a climate scientist at all. He is educated but not in climatology or even meteorology. His education was in industrial engineering and economics. This doesn't mean he has no right to his political opinions and he has plenty of those on various ways that government must take control of your life to force you to do the right thing. I'll get to those shortly. Pachauri jump into the global bureaucracy started small. He was a manager at the Deisel Locomotive Works. He went on to study industrial engineering and economics and taught economics. He continued teaching economics and became a research fellow at the World Bank. He was a board member of the International Solar Energy Society (which certainly has a financial stake in pushing warming theory) and involved in various energy associations. He is on the board of the National Thermal Power Corporation (another organization that would benefit financial from warming alarm). He was involved with various institutes and foundations. He is a busy man with fingers in many pies but what I can't find anywhere, is him being a climate scientist of any kind. His specialty is resource economics and industrial engineering. He has financial interests, or did, in industries that directly benefit by the policies the IPCC push (as does Al Gore.) But no credentials in climatology at all. Yet the Guardian describes him as the top climate scientist in the world. Given my natural skepticism about the universe I guess that would make Pachauri the top climate scientist if the known universe. I find the double-standard of the alarmists quite amusing. Individuals with credentials in relevent fields, who are skeptics, are dismissed as "deniers" and in the pocket of Big Oil (whether they ever got a dime in any indirect way or not from oil companies. But a man, with no credentials in a related field to climatology, who has clearly had financial stakes in industries that are posed to gain from warming fear, is proclaimed by one of the leading left-wing papers in the world as the top climate scientist around. Al Gore got convinced of apocalyptic environmentalism while appropriately studying theology. He too has stakes in alternative enegy businesses. He too is a career bureaucrat with an obvious political agenda. And the alarmist drool over him while dismissing skeptics who are far more credentialed than Mr. Gore. I am not saying that Gore and Pachauri have no right to hold their views or make them clear. I am merely pointing out how high the bar is for skeptics and how very low it is for the warming spokesmen. Personally I have to give Pachauri some credit. He is quite open about how much Nanny Statism he wants in order to push his climate agenda. In the worshipful Guardian article they say that Pachauri wants to have hotel guests facing an electricity meter in their room and charged for all electricity they use, even though they already paid for the electricity when they paid to rent the room. He thinks "hefty aviation taxes" need to be imposed so that government can use the funds to subsidize trains and he thinks "ice water in restaurants should be curtailed." According to his worshippers at the Guardian this top climate bureaucrat says we "must undergo a radical value shift" to avoid the catastrophe, end-of-the-world, apocalypic warming. Remember, he is not exactly arguing that people should be persuaded to change their values. He means that people should be forced to change their values through massive state control of things like their right to travel or even ice water in restaurants. He said: "I don't see why you couldn't have a meter in the room to register your energy consumption from air-conditioning or heating and you should be charged for that. By bring about changes of this kind, you could really ensure people start becoming accountable for their actions." F.U. Pachauri. Come on, when you pay $100 to $150 a night for a hotel room you are being held accountable for the few cents worth of electricity you use. These would be mandatory charges, actually mandatory double-charging, for heating a hotel room. And it is "this kind" of change he advocates—coercive, financial burdens imposed on people to punish them and push them into using alternative energy, like those that Pachauri had financial interests in. Pachauri says that there should be "a huge difference between the cost of flying and taking the train," he complained that "people were still making the 'irrational' choice to fly." And he suggested that "taxation should be used to discourage them." Previously "the world's leading authority on global warming," Pachauri, said that, "People should have one meat-free day a week" and that "diet change was important" toward controlling warming. Hmmm, so should government raise taxes on foods that Pachauri finds unappealing and subsidize the foods he prefers? As you might suspect, Pachauri is a vegetarian so any taxes on meat won't bother him. Of course, while attacking flying he himself flys the world with a frequency that would make the average person's head spin. But as an elite member of the global bureaucracy he doesn't pay for that directly—you do. Pachauri, according to the article in the worshipful Guardian, had flown into London and would flying out to Copehagen to push for international controls to combat the end of the world. According to his followers at the Guardian he "said that he also believed care use would have to be 'curbed': 'I think we can certainly sue pricing to regulate the use of private vehicles.'" Does he even drive his own private vehicle, or does he have drivers who chauffer him around? Of course, the taxes he wants to stop you from driving won't effect him, his charges will be paid for, like his air travel, by the people who pay the taxes. Nanny Pachauri, of course, flys constantly, is chauffered around by drivers, and stays in only the top class hotels. All the changes he proposes to regulate flying, driving, and hotel stays, won't impact him simply because he is a bueacrat who doesn't pay his own way. He lives off the taxes you pay which ultimately fund his position as the "world's leading climate scientist." I wonder what, in the Guardian's opinion, makes Pachauri the world leading climate scientist. It isn't his scientific credentials. Is it because he's a bureaucrat appointed by politicians to run a body of other bureacrats also controlled by politicians? Is it because he runs around the world, at taxpayer expense, proposing higher and higher taxes in order to control people and force them to act in certain ways? I personally suspect, from what I've seen, that one is "climate scientist" if you agree with the political agenda being pushed by the Left and you are not a "climate scientist," no matter your credentials, if you disagree with them. Note: According to IPCC documents the taxpayers of the United States pay more into the IPCC bureaucracy than those of any other nation. 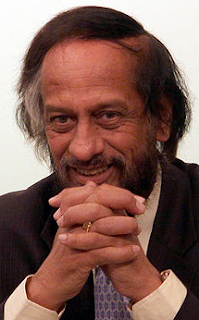 I tried to locate how much salary Pachauri draws from the IPCC, but the budgets I read were very unclear. I did locate that the secretary who answers phones, deals with correspondence, etc., has a salary starting at $74,000. And the IPCC budget shows hundreds and hudreds of thousands being spent on hundreds of "journeys" but it unclear who is taking them and for what purposes. posted by blog owner at 12/03/2009 07:44:00 PM DiggIt! Reddit Del.icio.us Slashdot It! The double standard at CBS.